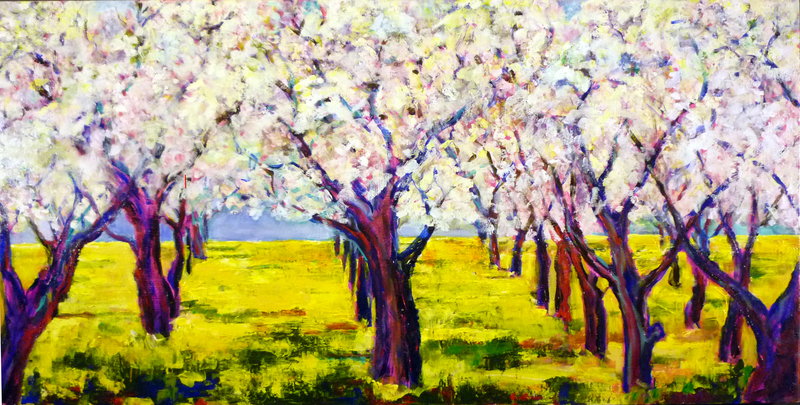 Part of my “prune” series, this painting depicts trees in full blossom with a carpet of bright mustard weeds. Every spring the trees would don their frilly white vestments just as the ground would sprout a riot of sharp-yellow mustard. For many years there was a weekend-long Prune Blossom Tour complete with tour buses from senior centers around the Bay Area, a luncheon served by the Dry Creek Neighbors Club ladies and tastings of prune cookies made by the 4-H cooking group. But this painting is more than a recording of a historical landscape. As I painted, I realized these trees had become dancing sprites in my mind. They were the companions of my childhood. The painting grows from my understanding of the trees as animate object, real living creatures.